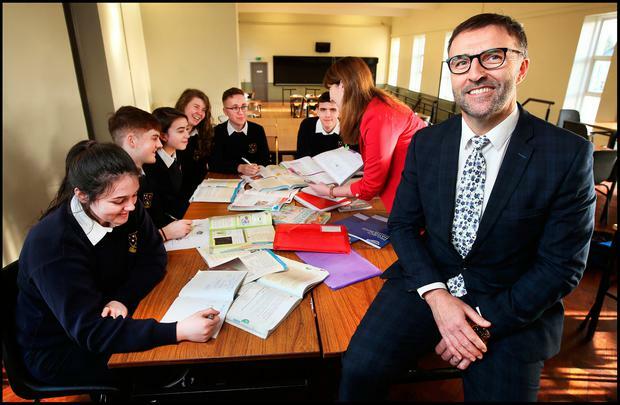 When Tom Lowry, principal at Moate Community School, Co Westmeath, offered to open the doors for late evening and Saturday study, he tapped into a big appetite for learning among Leaving Cert candidates. In common with many post-primary schools, the 820-pupil Moate CS offers supervised study for students from 4pm to 6pm. However, the principal noted that it was particularly popular with sixth years. So, three years ago, Leaving Certificate students were asked if they would like the hours extended. "The motivation for it was to try to encourage students to be constantly revising and reviewing their work, and to take charge of their own learning," he said. Mr Lowry said that the home might not always be the best place for study, so the school looked at what it could do to facilitate students. Many jumped at the opportunity and late evening study, from 6.30pm-8.30pm, was introduced. It allows the students time for a tea break after the earlier session. It runs two evenings a week from September to the October mid-term break, and for three evenings a week for the rest of the year. Last year, the principal took it a stage further with an add-on Saturday option and about 30 of the 120 sixth-year students are now taking advantage of the late evening/Saturday openings. "It is a rural school, and many students travel by the bus, so it doesn't suit everybody," he said. There are two three-hour sessions on a Saturday and students can opt to do either or both, giving flexibility for other pursuits, such as sports. It also means that a student can take Saturday evening and Sunday off. "We now have a huge number going to third-level and I would like to think this has been a factor," he said. Mr Lowry said parents were "very positive because they know the school is trying to support their children in every way we can".